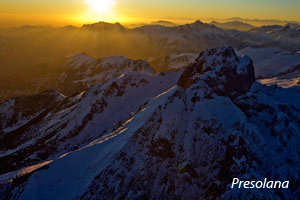 Welcome to Conca della Presolana, the pearl of the Bergamo Alps. This tourist location is situated in the heart of the Parco delle Orobie at 1000 m a.s.l., at the foot of the Presolana mountain (2521m), it is one of the most well known nature areas favoured by mountain lovers. The area is mountainous with many breathtaking valleys that offer a healthy environment in both summer and winter, a quiet landscape that is a real philosophy of life. Conca della Presolana… Mountain wellness!